T shape made with the body and sleeves. It is normally associated with short sleeves, a round neck line, and no collar. 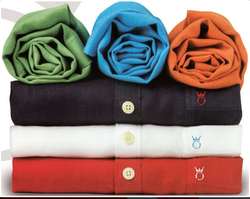 However, it may also include long sleeves, buttons, collars, or v-necks. T-shirts are typically made of cotton fibers (sometimes others), knitted together in a jersey stitch that gives a T-shirt its disti. 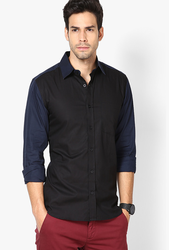 Stay smart and stylish this winter with this navy blue casual shirt from the house of Maq Styler. Crafted from stretchable cotton spandex, this shirt offers utmost comfort and breathability to the wearer. X Per Jeans & Co.